Israel and Morocco, both rich with ancient history, have millions of tourists each year from all corners of the world. Israel lays claim to spiritual landmarks and fascinating archaeological destinations. Morocco is where you can admire the grand Hassan II Mosque in Casablanca and explore Chellah, the medieval fortified necropolis in Rabat. Machneyuda is located in the heart of Israel’s most famous market, Mahane Yehuda. Having eaten here myself, I can wholeheartedly say that Chef Asaf Granit is able to effortlessly incorporate the rich colors and cacophony of Jerusalem into his delicious dishes. The open kitchen grants guests who sit at the bar a first hand view of the energetic chefs as they slice, dice, and sauté the vegetables while dancing to upbeat music and banging on pots and pans. The lunch and dinner menus each change daily. However, chashuka, their signature dish always remains. Chashuka includes chopped meat and hummus draped in creamy polenta and topped with crisp asparagus, mushroom ragout, and shaved Parmesan. Delicious flavors combined with the young and vivacious atmosphere make Machneyuda one of the most popular restaurants in the county! Reservations must be made 2-3 weeks in advance. Rama’s Kitchen founded 19 years ago offers a unique dining experience not to be missed. The restaurant overlooks the beautiful Judean Hills in the heart of Jerusalem creating a magical scene that sets the mood for the entire evening. Only open on weekends for both brunch and dinner, Rama’s Kitchen is continually ranked among one of the top restaurants in Israel. The seasonal menu incorporates traditional Mediterranean and Arab flavors while simultaneously integrating modern western cooking methods. Fruits and vegetables are organic or homegrown and the herbs grow in the restaurant’s nursery. A no-music policy creates a calm environment where guests can hear each other without distraction and appreciate the sounds of nature. Reservations are required. Imagine: grilled calamari stuffed with lamb and mozzarella then rolled into grilled eggplant and topped with goat yogurt, techina, roasted beans, and olive oil. 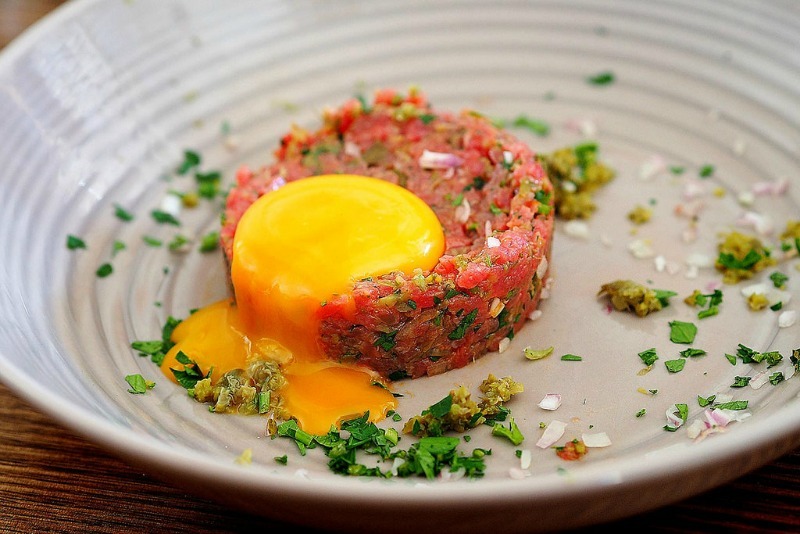 This is the level of culinary genius captured in each dish at Tel Aviv’s top restaurant, Catit. The constantly changing menu combines French and Italian flavors and always incorporates fresh and local ingredients. The wine and dessert menu nicely complement the sophisticated appetizers and entrees. While some may find this restaurant pretentious, combining too many international flavors into one dish, I personally found it delicious. The simple yet elegant surroundings, allow guests to focus solely on the food. A dinner at Catit is rather expensive; a more economical option is available during lunch when they offer a set-menu. HaKosem, translated to “the magician” in English, promises to be the best falafel, humus and chicken shawarma joint you’ve ever tasted. Fast-paced and inexpensive, HaKosem is most popular during lunch hours and grants tourists an authentic Israeli dining experience. 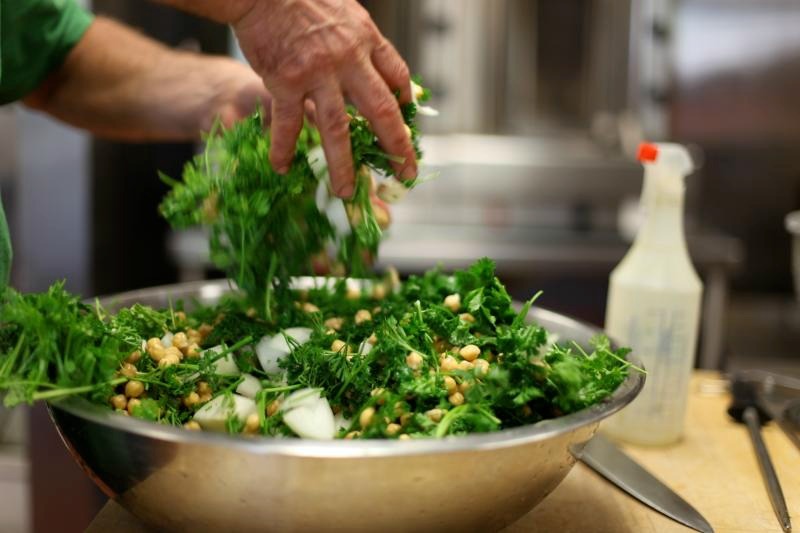 The falafels have an especially unique flavor due to imported Spanish chickpeas and the abundant use of rich spices including: cumin, coriander, ground sweet paprika, raw garlic, onion, sesame and nigella seeds. Housed in what was once an old palace and hidden among a labyrinth of dark and narrow Moroccan streets, Le Tobsil is perfect for romantic evenings. 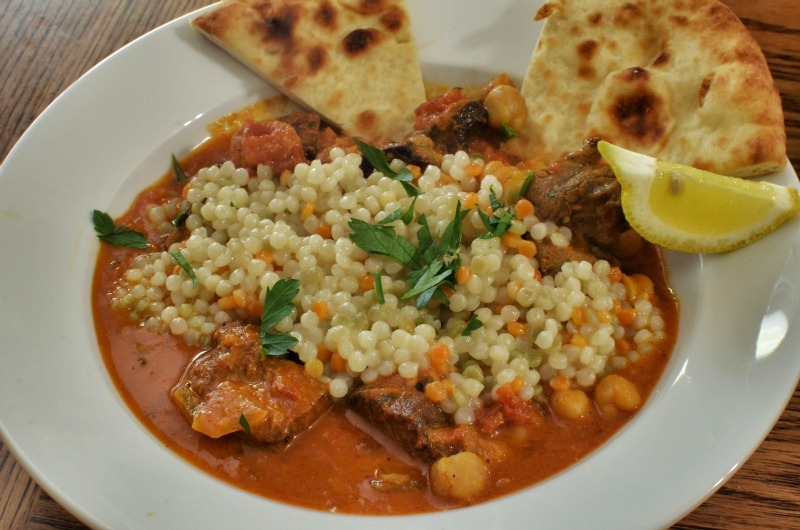 The famous Morocco restaurant incorporates fresh and local ingredients; the four-course menu offers eleven salads, two tagines (poultry and lamb) and delicious, mint-topped couscous. Gnawa musicians play outside creating a serene atmosphere which, paired with the delicious flavors, creates a dining experience guests are sure to reminisce about fondly. Originally opened in 1949, La Bagatelle is not only a family-run restaurant but also a historical landmark of Guéliz, Marrakesh. Closed for many years after the first owners passed away, La Bagatelle was reopened by a great-grandson in 2010 and sits only a few doors down from the restaurant’s original location. La Bagatelle combines authentic Moroccan and French cuisine, producing rich and unique flavors. The “nouveau style gem” always has classic Parisian dishes such as mimosa eggs and duck breasts with apples. In addition to the tasty menus, the ambiance of La Bagatelle is noteworthy, with a magnificent dome in the center of the space and the black and white photography of Guéliz hanging on the walls. Chez Abdou is unique not only in its style but also in setting. Guests can begin their day swimming in the warm Mediterranean Sea and when their appetite hits they can simply step into Chez Abdou where a selection of fresh fish and prawns are grilled on the open fire. 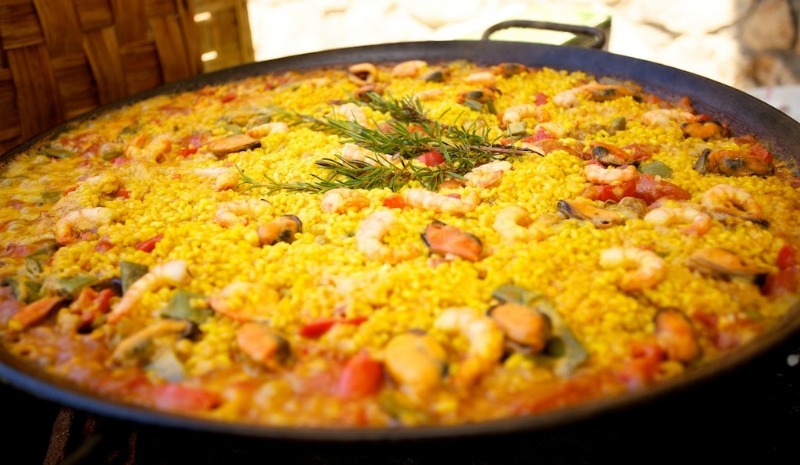 Grilled seafood is accompanied by perfected Paella and fresh, simple salads. The environment is welcoming, encouraging visitors to relax and linger, sipping leisurely on their Boulanger rose wine. The completely outdoor restaurant consists of a number of comfortable nooks, under green trees surrounded by colorful flowers. Is your stomach rumbling? Check out these food focused trips where you can visit local markets, dine on authentic cuisine, and attend a cooking class. 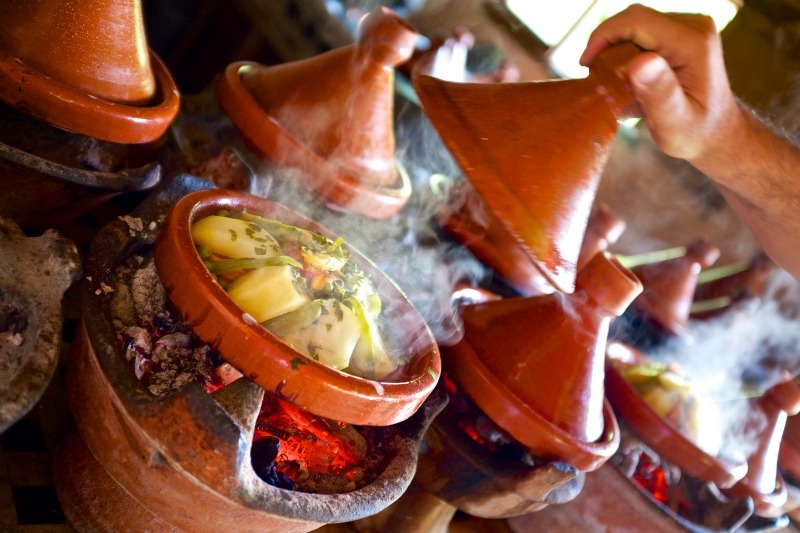 Real Food Adventure: Morocco - Highlights of this Intrepid tour include sharing a traditional Tajine with Berbers in the High Atlas Mountains and eating local delicacies on a tasting trail through Medina of Fes. 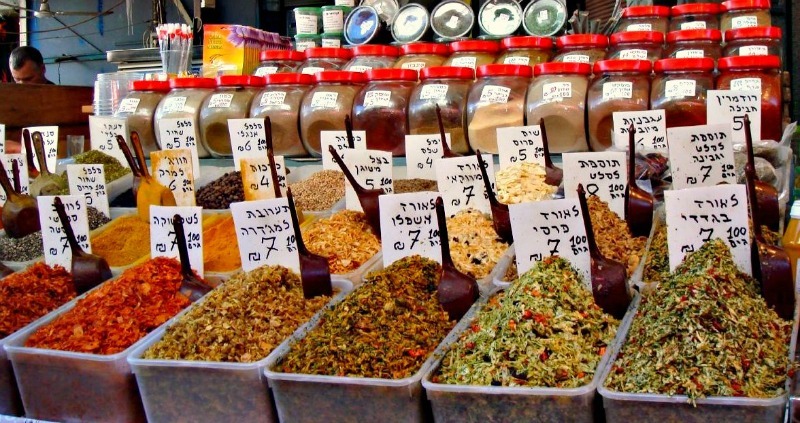 Real Food Adventure: Israel & the Palestinian Territories - Discover the wine region of Zichron Yaakov and taste a slice of Palestinian Musakhan on this tour with Intrepid. Atlas Mountain Trek - This G Adventures tour allows you to experience stunning summits and valleys and visit traditional villages where you get to relax at a family Gîte and savor home-cooked meals! Israel Bike Tour - Highlights of this tour with Backroads include drinking wine in parts of the world where grapes have been cultivated since ancient times as well as enjoying delicious Israeli, Lebanese and Druze cuisine. Delicious! 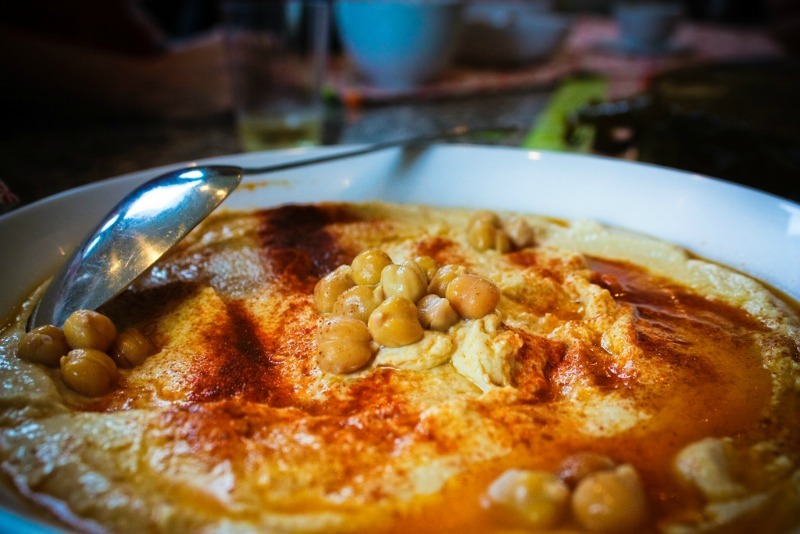 Hummus is one of my favorite foods and it's almost criminal that I haven't been to Israel yet! Well, for that reason and b/c I'm Jewish! This all sounds delicious and my stomach is growling :) . I've never been a fan of hummus, but pretty much everything else is calling my name! Great list, Gabi, love that I know exactly where I'm going to go eat when I visit! Will definitely need to keep this list on hand when I travel to Israel and Morocco! Great job Gabi!